Toyota is in trouble with an author who reunited blues legend B.B. King with one of his favorite Gibson "Lucille" guitars. In a 2013 book, Eric Dahl of Nashville tells the story of how he found a guitar stolen from King in a Las Vegas pawn shop. He bought the guitar for $2,162 and returned it to King for free. The blues great, now 89 years old, then gave Dahl an autographed version of a different Gibson Lucille during their meeting. Dahl contends that Toyota Motor Sales U.S.A. Inc. used the heartwarming story without his permission to make a TV commercial that was launched in the fall for the 2015 Toyota Camry. 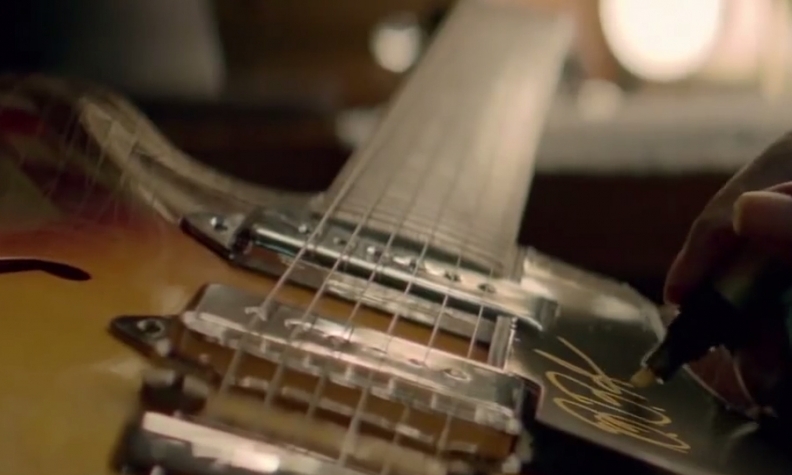 The 30-second spot shows a young woman finding a guitar emblazoned with "Lucille" in a storage bay and returning it to King. A grateful King gives her an autographed guitar. Dahl sued Toyota, ad agency Saatchi & Saatchi and ad producer Smuggler, in federal court in Nevada for copyright infringement. On Tuesday, March 10, U.S. District Judge James Mahan gave the case a boost by denying a Toyota motion to dismiss the case on the grounds that the ad storyline is publicly commonplace. Dahl's attorney, Jeffrey Galliher of Las Vegas, said Dahl tried in October to avoid litigation by offering Toyota the right to use the ad for a licensing fee.